This is a portable application, which means Universal Theme Patcher doesn’t require installation, and also will run from a USB drive. 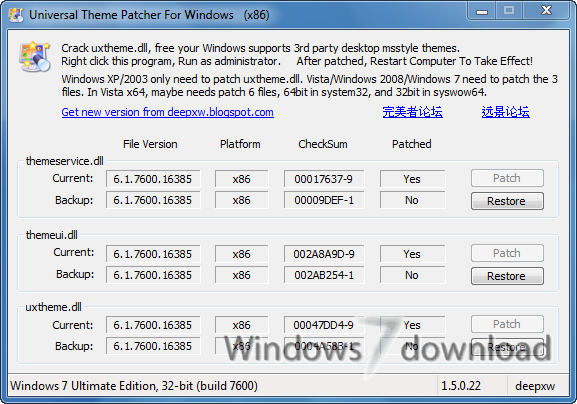 Universal theme patcher is a small program that patches the theme specific files in the operating system which enables the user to install 3rd party themes. It is a universal theme patcher. Without language limited. This is a portable application, which means Universal Theme Patcher doesn’t require installation, and also will run from a USB drive. When you run the EXE file, it will first tell you whether you need to apply patches to your system, then a further window opens with three areas, each with Patch and Restore buttons. 1 - Original file, without any modification. 9 - The file has been modified. 1, Can operate in normal mode. Do not need to enter safe mode. 3, Require administrator rights, UAC turn off. Right-click the exe file, select Run as Administrator. and using UniversalThemePatcher-x86.exe to patch the 32bit files in windowssyswow64. 5, After patch, Restart computer to take effect. 6, You can run program with argument "-silent" to patch in silent mode. + Support external language file. 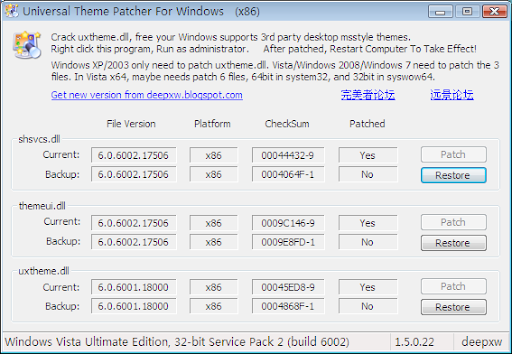 * Allow UniversalThemePatcher-x86.exe to patch the 32bit files in windowssyswow64. 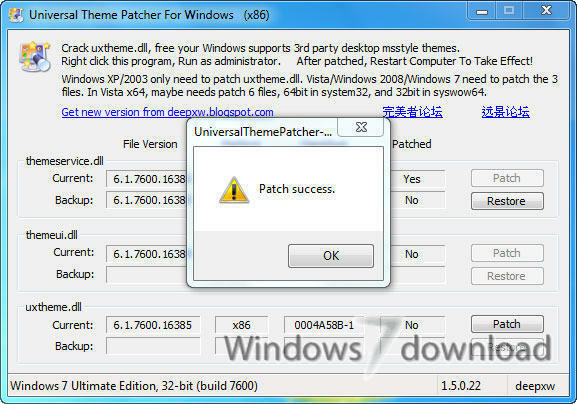 All Universal Theme Patcher reviews, submitted ratings and written comments become the sole property of Windows 7 download. You acknowledge that you, not windows7download, are responsible for the contents of your submission. However, windows7download reserves the right to remove or refuse to post any submission for any reason. 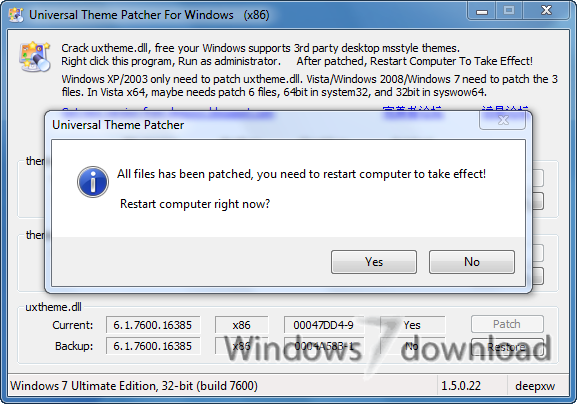 Windows 7 Download periodically updates pricing and software information of Universal Theme Patcher full version from the publisher, but some information may be out-of-date. You should confirm all information. Using warez version, crack, warez passwords, patches, serial numbers, registration codes, key generator, pirate key, keymaker or keygen for Universal Theme Patcher license key is illegal and prevent future development of Universal Theme Patcher. Download links are directly from our mirrors or publisher's website, Universal Theme Patcher torrent or shared files from free file sharing and free upload services, including Rapidshare, MegaUpload, YouSendIt, SendSpace, DepositFiles, DivShare, HellShare, HotFile, FileServe or MediaFire, are not used. A Nice And Good software.